It would be hard to find a civic, educational, cultural, or humanitarian institution in the Merrimack Valley that has not been touched in some way by the generosity of Nancy Donahue. 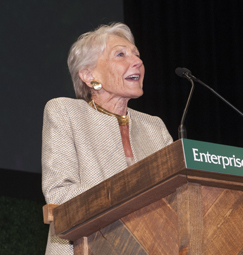 An active volunteer and generous philanthropist for over sixty years, Nancy possesses the skills to be a successful CEO at any company, but has chosen instead to follow her life calling in raising her family and creating positive and lasting change in the community in which she lives. She has inspired the dedicated support of thousands of fellow volunteers through her willingness to do the difficult work at all levels, from the grittiest hands-on job to hosting an elegant fundraising event. Countless humanitarian, cultural, and educational organizations have received generous financial support by the Richard K. and Nancy L. Donahue Charitable Foundation, founded by Nancy and her husband Richard, who was her partner in life, family, and community service for over sixty years. Our communities are simply a better place to live, work, and visit because of Nancy Donahue.